Indulge yourself in an alluring world of supreme relaxation at Zoëtry Agua Punta Cana, an exquisite escape embracing harmony, health and wellness. Our 96 luxurious, cane-thatched suites with hardwood floors and natural stone accents are located on a palm-studded white sand beach with crystal clear waters. 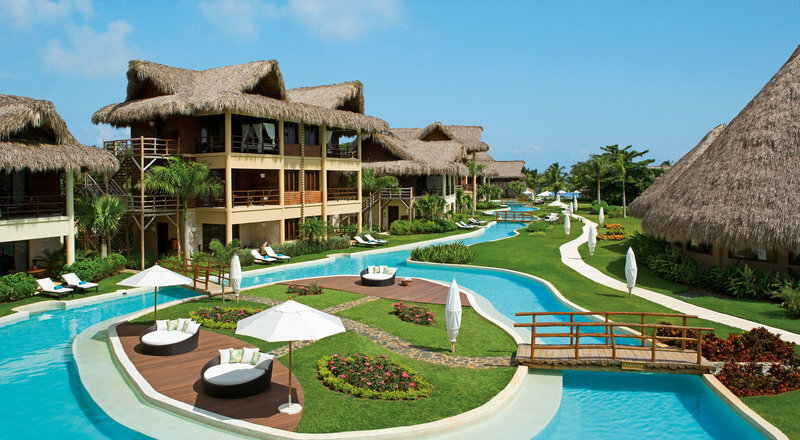 Located on the northeast coast of the Dominican Republic and just an hour from the Punta Cana International Airport. Immerse yourself in the Endless Privileges® experience that provides a more elevated and personalized stay than the typical all-inclusive and is part of your Zoëtry Agua Punta Cana stay. Intertwine wellness, gourmet meals, top-shelf spirits, fine wines, entertainment, and other luxury amenities during your Endless Privileges® getaway without having to worry about additional charges or gratuities. 96 Exquisite Suites with stunning ocean and garden views from private terraces or balconies. Enjoy bathrobes and slippers, luxurious Bvlgari amenities, full bath with soaking tub, maid service three times daily, a locked safe, WiFi, iPod docking station, daily refreshed mini bar with premium drinks, snacks and wine. Gourmet dining by award-winning chefs in our four distinctive restaurants, including three gourmet restaurants. Zoëtry Agua Punta Cana offers the finest in gourmet dining at our sumptuous internationally-flavored restaurants, where reservations are never required. Choose from an array of organic and heart-healthy à la carte dining options featuring locally grown fare and personalized dishes. Or take your time over a delectable premium coffee concoction at the Coco Café. New! 24-hour dining options allow guests to enjoy late night bites at Amaya. Or stay in and order room service. It’s all available at any hour day or night. Unlimited top-shelf spirits and specialty beverages in our three luxurious bars. Enjoy your favorite cocktail, a fine wine, or an ice-cold beer. Choose from an array of Caribbean cocktails at our swim-up wet bar, hang out at our beach front bar, or wind down in our lobby bar and enjoy a variety of top-shelf international and domestic spirits. You can also keep the party going with 24-hour room service and your own complimentary mini-bar. Your favorite drinks are served without limit or expected gratuities. Free Wi-Fi and free international calling to the US, Canada and Dominican Republic with Unlimited Connectivity. The mobile app also allows guests to view the schedules of all events, activities and restaurants at Zoëtry Agua, and learn about local destinations, excursions, and much more! Every guest can take advantage of a complimentary 45-minute horseback ride (1 per guest per stay, reservations required), and a complimentary 20-minute massage (1 per guest per stay). Revitalize and restore your spirits in our extraordinary spa—alone or with your partner. Experience soothing, tension relieving massages and a wide variety facial and body treatments by our expert therapists. And if exercising makes you feel good, we have what you need to work up a sweat 24 hours a day. The spa and salon are open from 9 a.m. to 8 p.m. The fitness center never closes.